« Crossing Report 27/28 February 2019. Have you ever ……..? As the date for your crossing approaches, you can’t help yourself from flicking to the weather forecast almost daily. The weeks leading up to our crossing had been incredibly dry but as per usual it poured with rain in the final few days, nicely topping up the bogs, Wheeldale Beck and other streams and just about anything else designed to hold water. We started our crossing at 6:45 am with clear blue skies and a temperature reading of -3 degrees meaning that the muddy patches would be frozen solid, at least for the first couple of hours. 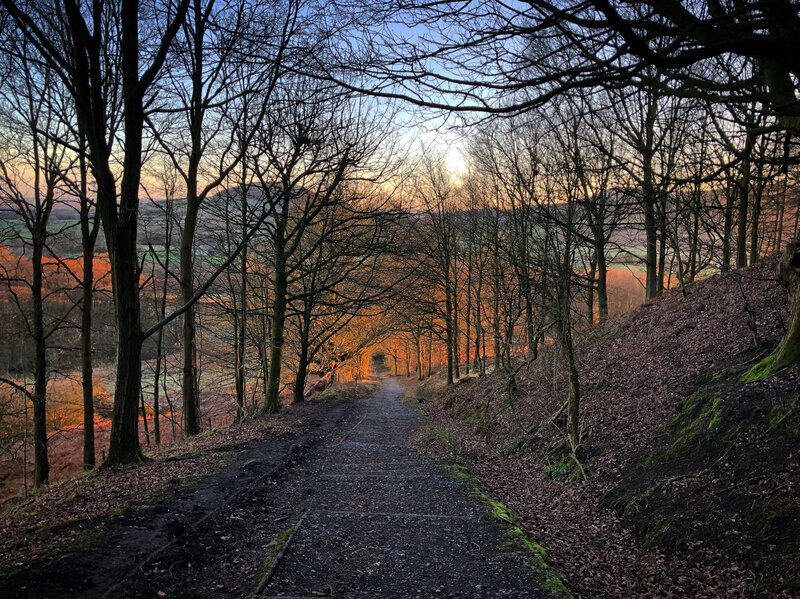 The sun was rising as we hit the tarmac heading up from Cod Beck reservoir, towards Scarth Nick woods and the day was warming up, although it was still bitterly cold in the shade and on the tops. We took the lower path around the former Coalmire plantation as I was keen to see what this was like now the area has been de-forested. I can see there have been significant path improvements along here, especially as you head down towards Clay Bank so this factor coupled with the frozen ground made progress fairly easy. Over the road and back on a familiar path, up over Round Hill onto Bloworth Crossing. The sky was starting to cloud over but the forecast had promised no rain until the evening, so we were still high and dry. 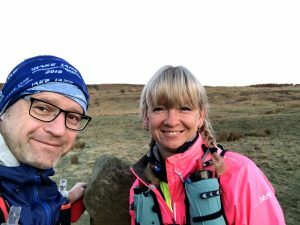 The wind picked up as we trudged the railway path – as it always does – and chased us along the Flat Howe path to Old Margery where we had our first meeting with our support team Gerry and Julie. That section is so much easier in daylight than it is in the dark. 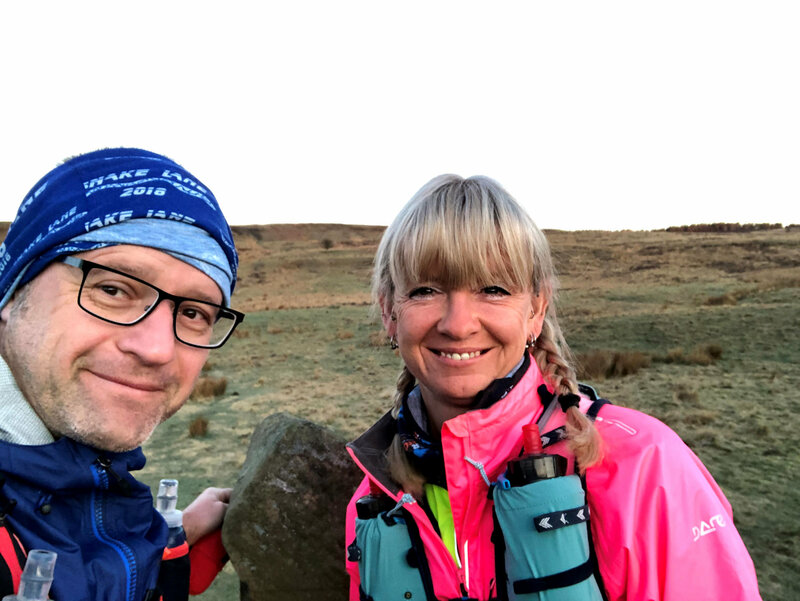 Gerry pointed out a variation on the path across to Fat Betty which we duly followed, before meeting the support crew again at the FryUp turn off, just before Rosedale Moor. By now the ground had thawed suitably and the bogs were as boggy as you like. No bouncing across springy peat today, it was a bit of a slog over to Shunner Howe down over Hamer road and onto Wheeldale Moor. The light cloud had turned somewhat darker and as we were approaching Blue Man, a light drizzle soon turned into a permanent downpour that would accompany us for the rest of the crossing – so much for the weather forecast. The Blue Man section was rocky and squelchy in equal proportions but navigated without drama. Come Wheeldale Beck, the stepping stones were underwater but not too deep so we were able to wade across – our feet were drenched already so this wasn’t making us any wetter! 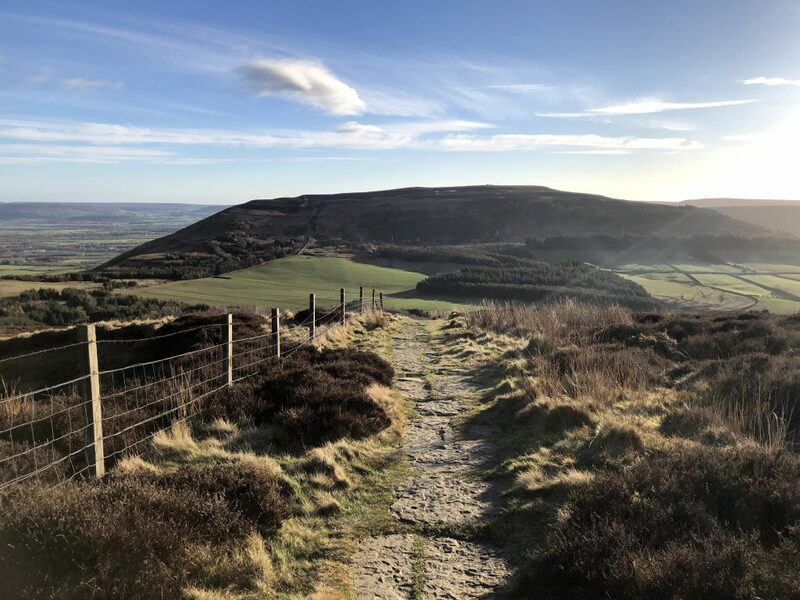 The climb up to Simon Howe was fairly good going, the ground wasn’t as waterlogged as the past ten or so miles had been, so we made good headway over to our next support spot at Fylingdales. I had been fairly snap-happy for the first half of the walk but the camera never left my pocket after Flat Howe as the landscape was very wet and grey. Normally the march up to Lilla Cross is quite a slog especially in the heat, but on this occasion it was fine and given that we had wet feet already the sodden ground didn’t slow us down. There have been significant improvements to the path leading up to Lilla Cross and down towards Jugger Howe – parts of this are still a work in progress so every now and again you go from a nice smooth path to navigating your was through ankle-snapping stones, but within a few months this section of the path will be a joy to walk. Jugger Howe is still a steep down and up and not always welcome this late in the game. But for me it means your thighs are doing the work so it does give you ankles a brief rest (that’s me looking for a silver lining in the clouds). Not far to go now, and having looked at my watch I saw we could just about squeeze in a sub-10 hour crossing. So we gave our support party the briefest of waves as we crossed the busy A171 before heading towards the mast overlooking Ravenscar. Still raining, still windy, still cold, but as the mast was looming large none of that mattered any more. 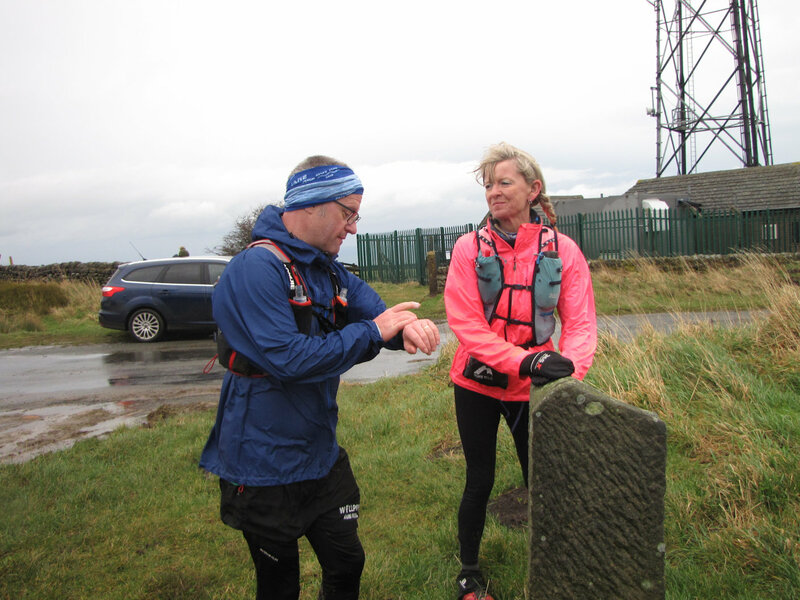 Upping our pace a little, we touched the Lyke Wake Stone and a check of the watch gave us a finish time of 9 hours, 59 minutes and 55 seconds. I can’t think of a better way to spend the day, can you? This entry was posted on Monday, March 18th, 2019 at 3:18 pm	and is filed under Crossing report. You can follow any responses to this entry through the RSS 2.0 feed. You can skip to the end and leave a response. Pinging is currently not allowed.